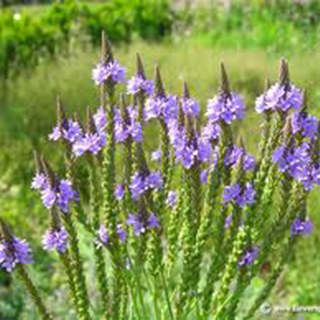 Once regarded as a cure-all, and sacred to the ancient Greeks, Romans, and Druids, vervain, which grows throughout much of Europe, Asia, and North Africa, is associated with a wealth of folklore and was once used in fortune-telling. Today it is a favourite after-dinner "tisane" to stimulate the digestion, and is also used to ease headaches, nervous tension, and depression. Vervain is intensely bitter and as such, will improve sluggish digestion. The herb is sedative to the nerves and also sometimes effective against headaches. The tea or tincture is also taken hot to sweat out fevers, for treating colds and flu, and also makes an effective galactagogue for increasing milk production. Take 40–80 drops (2–4ml) 3 times daily for nervous exhaustion, stress, anxiety, or depression; as a liver stimulant for sluggish digestion, toxic conditions, or jaundice; and with other urinary herbs for stones and excess uric acid. Drink 1 cup (1–3 tsp aerial parts per cup water) 3 times daily as a digestive stimulant, or in feverish conditions; take 1 cup at night for insomnia. Use on eczema, wounds, and running sores or for painful neuralgia. The poultice of the fresh, mashed plant can be applied to ease muscle soreness or the pain of rheumatism, and to speed the healing of wounds, burns and lesions. Dilute 2 drops in 2 tsp (10ml) of water in a dropper bottle and take in drop doses as required for mental stress and over exertion with related insomnia and an inability to relax. The strong tea is useful for making a sitz bath for treating haemorrhoids. Prefers a sunny site in well-drained soil, but tolerates other conditions. Sow the seeds in a seed bed in spring or autumn and transplant (24in/60cm apart) when established, or propagate by division in late spring. Self-seeds in the right conditions. Traditionally collected when the plant is in flower.